Founded: 1991 by Lillian and David Wang, owners of menswear clothing stores in Taiwan. Hours: Roughly 40, overtime is available. Benefits: Health care and profit sharing. Languages spoken: Cantonese, Mandarin, Spanish and English. In 1991, it wasn’t hard for immigrants like Wei and Ilona’s parents to set up a knitting business in El Monte, a Los Angeles suburb. With a couple of looms, you could do contract work. With more, you could prosper. Which is what Andari did—right up until the 2008 recession. "My father wanted to close and shift production to China," recalls Wei Wang, who, at the time was working as a software engineer at Microsoft. "My sister and I said, 'give us a year'. We thought if we found high-end customers, we could survive." Wei and Ilona's strategy: Instead of competing with Asia on cost and volume, Andari’s edge would be quality. "With our skills and our education, we thought we could turn the company around quickly," says Wei. "Looking back, we were naïve." The siblings overestimated the speed at which new clients would arrive—EILEEN FISHER was among the first in 2011. And they underestimated what it would require to keep brands coming back. With EILEEN FISHER's clean-lined pieces, every flaw stands out. You notice the shoulder seam that doesn't lie flat on the body, the ribbed trim that's attached with a bulky seam or the hem that hikes ever so slightly when back panels are linked with the wrong tension. The problem wasn't skill—Andari’s workers have held similar jobs in China and can do expert work. The problem was speed. "At Microsoft, I worked in a very collaborative culture," Wei says. 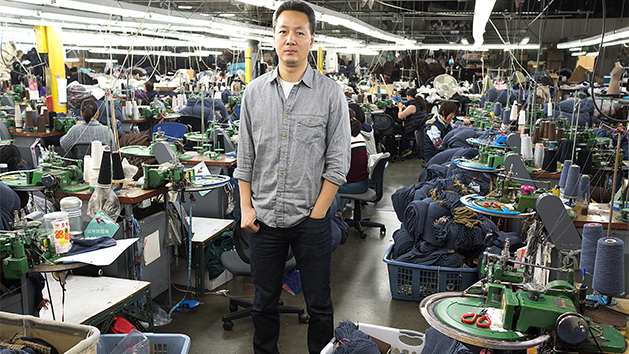 "At Andari, the workers did their tasks—maybe it was linking a sleeve—and didn't think about what was next. They were paid by the piece and their incentive was to work as fast as they could so they'd make more money. We had to tell them slow down, take more time, work as a team—we'll raise your per-piece rate so you can do better work and still make the same amount of money." Despite the challenges, attention to quality has proved a successful business plan. In 2014 Ralph Lauren placed its first order for the Winter Olympics and is now a steady customer. EILEEN FISHER has grown its Andari business by 600%—48,069 sweaters in 2016 vs. 6,855 in 2011. But here’s what the numbers don’t show. Since 2011, EILEEN FISHER’s sweater and manufacturing teams have invested countless hours to visit the factory and build the relationship. Today, they trust that Andari will take a designer’s idea and make it even better. "Knitting sweaters is a nuanced art," says Julie Rubiner, Sweater Team Leader. “What looks simple on paper actually requires great skill to translate into something that drapes and moves when you wear it.